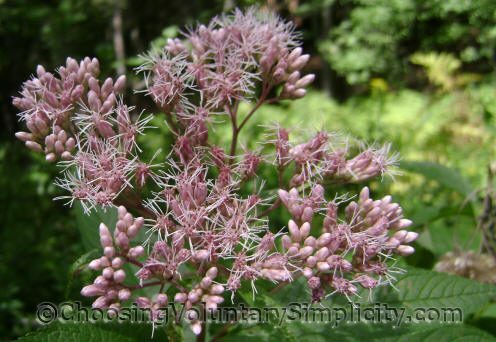 Joe Pye Weed (Eupatorium purpureum) is a native perennial that grows readily in moist areas and forms clumps of tall sturdy plants that can grow up to six feet tall. In August the flowers start to open, the clumps become a mass of color, and the sweet vanilla-like fragrance of the flowers becomes an irresistible attraction for bees and butterflies. From our experience, Joe Pye Weed will grow almost anywhere, but it really thrives in sun and rich, moist soil. The dome-shaped compound flowers are made up of five to eight florets and range in color from very light (almost white) pink to a deep purple. The leaves are about six inches long and are lance-shaped with serrated edges. Some of the flowers will produce seeds with five ribs and long bristles. 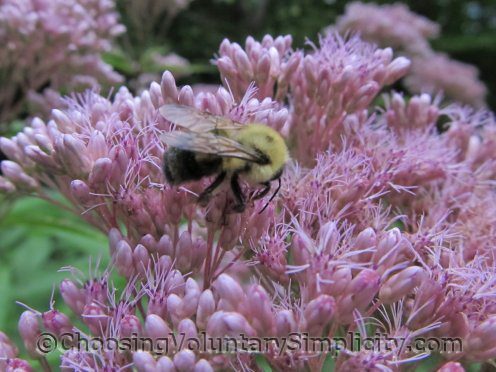 Collected or purchased Joe Pye Weed seed can be direct sown outside in the fall. If you are planting the seeds inside for transplanting in the spring, the germination rate will be higher if the seeds are stratified first. If we left our small meadow unmowed it would be almost covered with Joe Pye Weed. 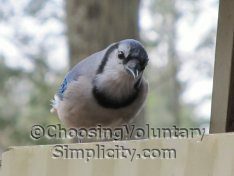 We compromise by mowing the center area and allowing the Joe Pye Weed plants free reign in the areas bordering all three sides of the meadow… and the clumps of Joe Pye Weed there are so dense and so close together they make a wonderful living fence. Joe Pye Weed is named after a Native American herbalist named Joe Pye, who is said to have used the herb to lower fevers and as a cure for typhus. 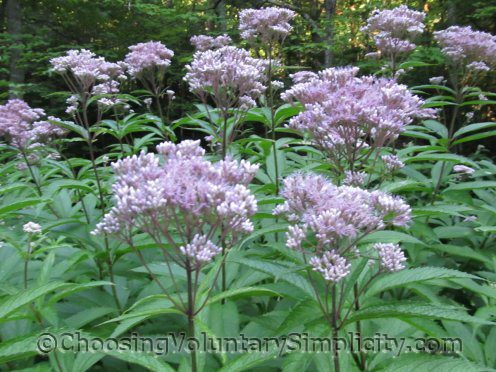 Other common names for this hardy perennial are Sweet Joe Pye Weed, Gravel Root, and Trumpet Weed. You have joe pyeweed growing wild! I just saw this in a catalog for $17.00 a plant! Very pretty. You have such lovely plants and gardens. Does joe pye-weed grow in other colors too, or just the pink? We have something that looks like your pictures but the flower is almost white. Seventeen dollars a plant? Wow! As to colors, we also have some joe pye weed that is almost white, but the pink is more common here. Do you have to cut Joe Pye weed to the ground to prepare it for winter? John, here it doesn’t seem to matter. Each fall we do cut down most of the joe pye weed that is growing along the perimeter of our meadow, but that is mostly just to “clean up” in preparation for spring. The clumps of joe pye weed growing along the roadsides never get cut, and they come back every year just as enthusiastically as the plants we cut. I am going to plant this for the bees and butterflies. Do you think this might be ok to plant near monarda? My monarda has been cut back as it got “dusty” looking. Too wet, I think, but might be great for Joe Pye. I really like the looks of this plant! Thanks, Shirley! Trying like crazy to get these started in Northern VA…unfortunately the deer herds always find them! This year I have hidden seeds in among the goldenrods…they get chewed too but just the tips! Joe Pyes are among my favorite flowers….hummingbirds love them too!